Georges Hausmann came from a Protestant family of textile merchants from Alsace. He studied law and at the same time he took classes at the Conservatory in Paris. He started his professional career as sous-préfet of Nérac and his career progressed rapidly until Persigny appointed him prefect of the Seine département on June 24th,1853. He held this post until 1870. In that year he was dismissed by the liberal government under Émile Ollivier. Hausmann had married Octavie de Laharpe. His daughter Fanny Valentine (b.1843) would become the mistress of Napoleon III and bore the emperor a son in 1865. In 1852 Napoleon III commissioned him with the modernization of Paris. The emperor wanted Paris to be safer, sanitary and hospitable. Broader streets should prevent rebels to build barricades and traffic should flow easier. Haussmann created the Bois the Boulogne and removed the gardens of Luxembourg Palace to make room for new streets, like the Boulevard de Sebastopol. New bridges were built and a new water supply system was put in place. A new opera house and other public buildings were realized and the central market place Les Halles was constructed. His plan to remove all cemetery's in Paris and replace them with a huge area outside the city was never realized. The small house where he was born was demolished in favour of the Boulevard Haussmann. In 1857 Hausmann became a senator and in 1867. In 1862 he received the grand cross of the Légio d'honneur and in 1867 he entered the Academy of Fine Arts. After 1870 Haussmann lived for several years at Cestas near Bordeaux, but in 1877 he returned to Paris as a Bonapartist memeber of the National Assembly for Corsica (1877-1881). During the last years of his life he wrote his memoirs. 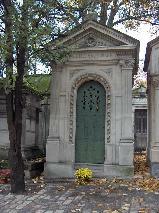 The grave of Georges Eugène Haussmann at Père Lachaise, Paris.